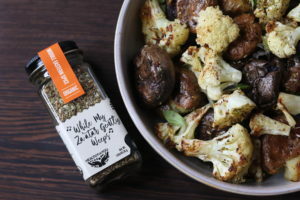 I love the combination of roasted potatoes and cauliflower and this recipe absolutely comes alive with the additional flavor profile of my Middle Eastern Spice, While my Za’atar Gently Weeps. This dish makes a great side for simply baked fish or chicken. It’s great for a crowd and its an easy cleanup! Prepare a large baking sheet with foil and set aside. Add the potatoes to a large saucepan add water to cover the potatoes and bring to a boil and cover. Boil for 12-15 minutes until potatoes are soft. While the potatoes boil, add the cauliflower to a medium-sized glass bowl, add ½ the olive oil, sea salt, and pepper and toss to coat. Add the cauliflower mixture to the baking sheet making sure there is no overlapping. Bake in the oven for 10 minutes, stir and return to the oven for another 2 minutes. 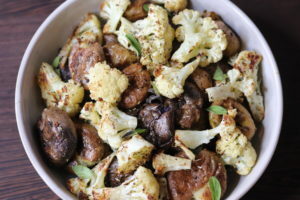 The cauliflower should be crispy on the edges and soft at the stems. When the potatoes are soft, drain the water and add the potatoes to the same baking sheet. Using the back of a wooden spoon, smash each potato until flat. Add the remaining oil to the potatoes, sprinkle with sea salt and pepper and bake for 30 minutes. Halfway through, turn the potatoes so they crisp on the other side. Add the cauliflower back to the baking sheet with the potatoes and bake for an additional 2-3 minutes until reheated through. Remove from oven and add to a large bowl, then sprinkle the potatoes and cauliflower with the Healthy On You® While My Za'atar Gently Weeps spice blend. Garnish with fresh herbs if using and serve hot.